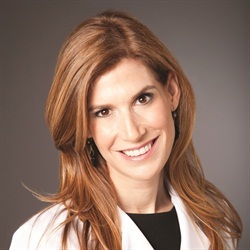 We are all too aware of the signs of aging on our faces. Loss of volume creates accentuated hollows and wrinkles and a change in texture becomes apparent from collagen breakdown. Few, however, are aware of the fact that our nails also age. These age-related changes are apparent on both the fingernails and toenails. Nail dystrophy (abnormal nail growth) can appear similar to fungal nails. Here you can see how the anatomy of this patient’s feet would predispose the feet to a lot of rubbing within the shoe, resulting in changes to the nail. As we age, our nail physiology actually changes as part of the nail growth plate (nail matrix) begins to thin. This phenomenon results in the development of vertical ridges along the nail. Compromised circulation or less efficient blood flow to our extremities can also contribute to nail ridging. 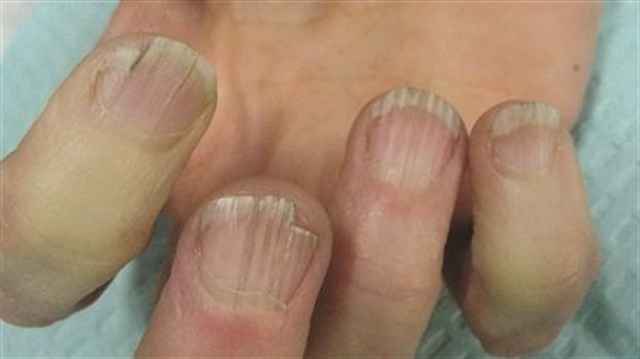 These ridges are called onychorrhexis, a clinical sign of brittle nails. Interestingly, we see the effects of circulatory compromise in patients who are paralyzed on one side, and I have even observed this in patients who have one arm in a cast for an extended period. The extremity that has a compromised range of motion will often have brittle nails while the opposite, functional extremity will have normal nails. Nail growth rates also affect the appearance of the nail. As we age, our nails grow at a slower rate. In fact, studies have shown statistically significant differences in growth rates before and after age 40. As our nail growth rates slow, the nails are exposed to considerably more environmental influences and these exposures over time can affect the overall appearance and strength of our nails. This thickened, yellowed nail is the result of chronic friction, not fungus. Interestingly, this patient — a runner — was treated with a laser for fungus by a podiatrist, but never tested positive for fungus. One of the most common age-related nail changes I see in my practice is onycholysis, when the nail lifts off of the underlying nail bed. With age, nails fail to adhere to nail beds as firmly. Consequently the slightest trauma, such as overly vigorous cleaning under the nail with a tool, can result in the nail lifting off of the nail bed. With age, nails fail to adhere to nail beds as firmly. Every day in my practice I see several patients who are referred to me for evaluation and treatment of toenail fungus. Often, these patients don’t in fact have any evidence of nail fungus; instead they have nail dystrophy — thickening and yellowing of the nail. Not every thick, yellow toenail is due to a fungus! As we age, our feet change due to years of repetitive micro trauma. Other factors that affect our feet and our nails include gait, postural alignment, weight, and weight distribution changes. The trauma is not usually anything “traumatic.” In contrast, it is due to years and years of friction and rubbing within our shoes. Chronic micro trauma directly affects the nail because the nail growth begins anatomically between the distal joint and the cuticle. Therefore any repetitive trauma at that region will affect the way the nail grows and appears. Usually these changes result in a thickened, mal-aligned toenail. I always point out to my patients that their feet look very different today than they did when they were in their teens for example. As our feet change, our toenails follow suit. Compromised circulation or less efficient blood flow to our extremities can contribute to onychorrhexis (nail ridging). Other age-related toenail issues include subungual hemorrhage. This occurs when the toe is stubbed or injured and blood collects under the nail forming a blue, violaceous patch at the nail. This phenomenon is more common in people who are taking blood thinners such as aspirin or Coumadin. These medications are extremely common among an older population. Subungual hemorrhages occur when the toe is stubbed or injured and blood collects under the nail. This phenomenon is more common in people who are taking blood thinners. As we age, it often becomes more challenging to physically reach our toenails as well as to manually handle a nail clipper. Proper foot care often suffers as a result. The elderly can consequently be predisposed to nail abnormalities such as onychocryptosis (ingrown nails) as well as onychogryphosis (curved nails that look like a ram’s horn). Seeing a podiatrist for regular foot and nail care becomes important to prevent these issues and to maintain healthy feet in an elderly population. When caring for toenails, they should be cut straight across as opposed to on a curve to prevent the formation of ingrown nails. When using a nail clipper, make sure that it is replaced periodically, as the blades dull and oftentimes we don’t realize we are using a clipper that is 10 years old. Dull implements are more difficult to use, especially when toenails are thick and brittle. If an individual is not physically able to cut his or her toenails, then regular podiatric care becomes essential. I advise salon-goers not to allow the manicurist to clean under the nail as this very often results in onycholysis as mentioned above. Cleaning under the nail should always be done very gently and if your client has shown tendencies toward separation, skip the cleaning entirely! You may also like: A Day in the Life of a Nail Expert: Yellow Nails.